Carl Sinclair Hood, age 85, died at home surrounded by his family on Friday, March 29, 2019, in Christiansburg, VA. Carl was born on September 21, 1933 in Chicago, IL, to parents Carl Sinclair and Bernice Hood. 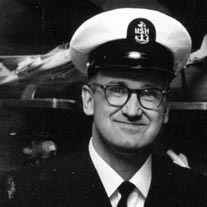 He worked for the Chicago Tribune until he saw the world with the US Navy. Retiring as a chief petty officer in 1974 after 20 years. He graduated from Virginia Tech in 1979 with a BA in History. Carl loved his family, art, and a book was never far from his reach. The Lord was his shepherd. Carl is survived by his wife of 51 years, Susan; his son Jonathan and daughter-in-law Nikol Hood, of La Grange, GA; daughter Susanna and son-in-law Seth Chamberland of Salem, VA, and daughter Amanda Hood Bailey and son-in-law David Bailey of Abingdon, VA. He was especially proud of his six grandchildren, Maggie and Henry Hood, Emma and Mary Chamberland, and Alex and Jaden Bailey. Carl is also survived by his brother Patrick Hood and sister Colette Smith. A service at Southwest Virginia Veterans Cemetery in Dublin, VA, will follow at a later date. The family would like to thank Carilion Hospice of the New River Valley and Christiansburg Rescue Squad. In lieu of flowers, donations can be sent to Friends of the Library, Montgomery-Floyd Regional Library.